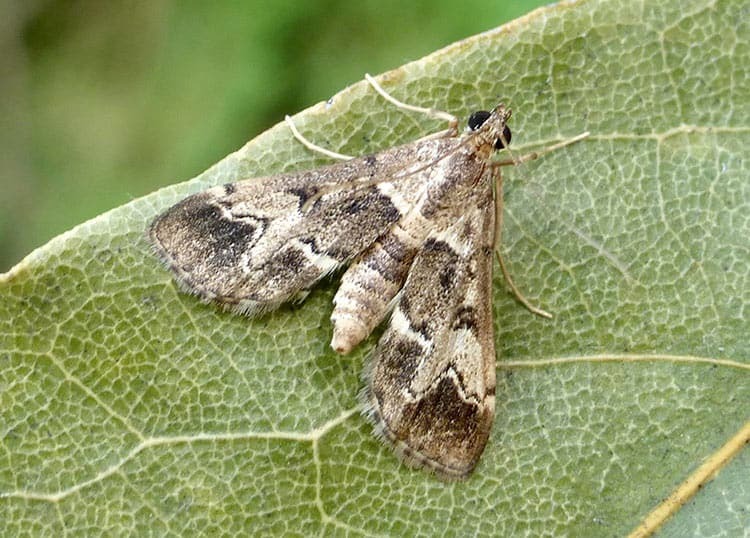 Duponchelia adults have a wingspan of 19 to 21 mm. Their forewings are gray-brown in colour with two yellowish-white transverse lines. The outermost of these lines has a pronounced “finger” that points towards the back edge of the wing. When at rest the wings are held out from the body forming a triangle. The adult body measures 9-12mm in length. The head, antennae and body are olive brown. The abdomen has creat-coloured rings encircling it. The legs are pale brown. The length of development for this pest varies according to temperature. In a greenhouse setting (at 68°F or 20°C), the development time is four to nine days for the eggs; three to four weeks for the larvae; one to two weeks for pupation; and one to two weeks for adults (six to eight weeks in total). The adults quickly mate with females laying eggs within 24 hours of emergence. The females are capable of laying 200 eggs during her lifetime. In a greenhouse setting, eight to nine generations per year have been recorded. Duponchelia inflicts damage to roots, leaves, flowers, buds and fruit on which it feeds as larvae. In leaves, this feeding damage appears first as rounded or crescent-shaped bites on the outside of the leaves, but eventually the whole leaf is eaten. The leaves that are attacked are usually at the base of the plant but leaves higher in the canopy can also be attacked if the plants are placed very close together. Later larvae can even burrow into soft woody or herbaceous plant stems causing more damage. The holes left by the boring of this pest into the stem can facilitate infection by the fungus Botrytis cinerea.